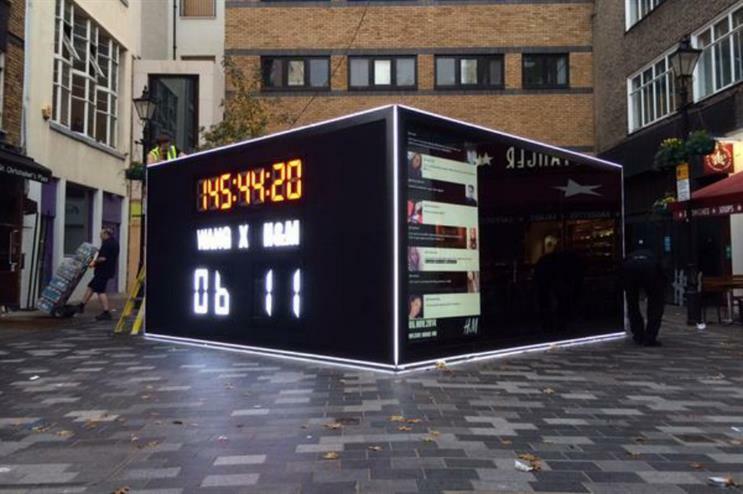 Fashion retailer H&M has created a giant, interactive cube to mark the launch of its upcoming range designed by Alexander Wang. Located in St Christopher’s Place piazza in London, the Box of Wang is available to view until today (5 November). The full collection will be available to purchase tomorrow. The installation features a giant countdown clock, a live tweet wall and ten pieces from the new range hidden inside the box. To see the garments from behind the hidden wall, shoppers need to send a tweet, including their location at St Christopher’s Place, with the hashtag #AWxHMreveal. Once the message has been sent, a panel moves to reveal one product from the collection.